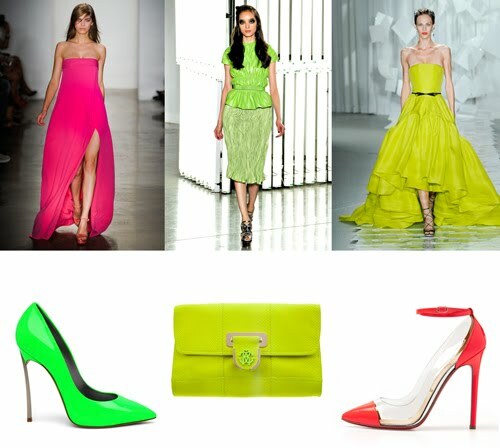 When was the last time you wore neon? Well, you'll want to this season as these intense hues pop up in our favourite designer collections from Jason Wu to Christian Louboutin. Of course, if you kept an eye on Fashion Week Street Style, you may have noticed that neon accessories are must-haves for spring. Delicate little feather bracelet by LeiVanKash is being given a dose of neon with a vivid green cord, and Dannijo is brightening up their sparkly baubles with a fluorescent touch. The girliest of the neons is this bright fuchsia. For a hefty dose of neon pink, we are loving CC Skye's wrap bracelet and for a more subtle approach, we are loving the elegant pink and blue bracelet by Dannijo. Is there anything brighter than this intense neon yellow. (Okay, how gorgeous is this Jason Wu gown?) For a touch of glamour, we are coveting the super colourful 'Color Me Crazy' earrings by Erickson Beamon and for more casual days, one can't go wrong with a classic screw bracelet by CC Skye.